This is one of those books that I haven't gotten around to reading. I really want to make an effort to read this soon! Great review! Very thorough on the banning issues! Don't underestimate yourself, you did a great job. Hitchens would be proud. I love the point you make about how those who ban the book for anti-government ideas are essentially admitting their guilt. Really you'd think they'd allow the book out there and go in public talking about how awful it is that such governments exist and how wonderful it is their regime isn't like that. It seems like that would be a far more successful strategy. I LOVE this book! And this cover is gorgeous! I read this in high school and enjoyed it, but it was upon rereading the book last year that I truly fell in love. When Boxer was taken away to the "veterinarian" I cried. I am a bit of a cry baby, but still, it was sad! I really need to read this book. Thanks for the background info! I didn't appreciate this book when I had to read it for school but it is a great read. I enjoy your blog and I am passing on the Versatile Blogger Award. Thanks for the thoughts and the link! 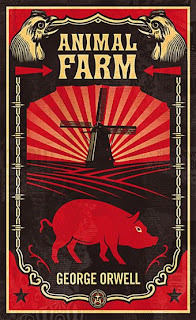 It is difficult to provide a political message and still tell an interesting story and Orwell does both quite well. This is one of my all-time favourite books. I read it in year at school, when I was 13, and even though I didn't get all the allegories, I loved the story. Then when I did my GCSEs, I studied Russian history and just found it fascinating. 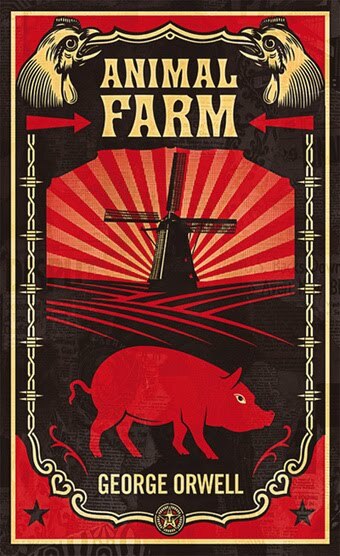 When I re-read Animal Farm I loved it even more. Each time I read it, I notice another link to that period. I love Communist history, so I'm definitely biased towards this book!